The Ann Arbor city council has until its second meeting in August to put various questions before voters on the Nov. 6, 2012 ballot. 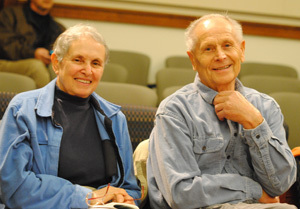 At its July 2 meeting, the council heard from Jane Lumm (Ward 2) that she and Mike Anglin (Ward 5) are working to bring a ballot question to Ann Arbor voters that would further tweak a city charter provision about the sale of parkland. The charter provision had been approved in November 2008 by a 81%-19% margin (42,969 to 9,944). The tweak would involve adding actions like “lease,” “license,” or “re-designate” to the set of actions on city parkland that would require a voter referendum. At its Feb. 22, 2011 meeting, the Ann Arbor city council authorized a fee increase at the city’s golf courses, and reappointed members of the city’s golf courses advisory task force. Power golf cart rentals for 9 holes at Leslie Park and Huron Hills will increase from $7 to $8; for 18 holes, the rental fee would increase from $13 to $14. City staff estimate the increases would generate $25,000 in additional revenue per season. Weekend fees for 9 and 18 holes at Leslie Park golf course will increase by $2 and $1, respectively, and the twilight fee would increase to $16, up from $15. These increases would generate an estimated additional $12,500 in revenue per season. 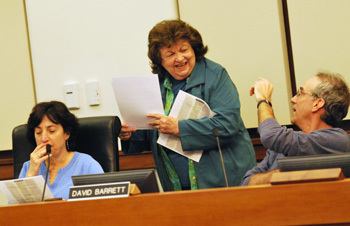 In addition, the council approved raising the senior citizen qualification age to 59 for the 2011 season. That’s part of a consultant’s proposal to incrementally increase the qualification age from 55 to 62 by adding one year to the minimum age annually. The actions came to the council in advance of the regular budget, so that the rates can be in place for the opening of the courses in the spring. At the council’s meeting, the mandate of the city’s golf courses advisory task force, first appointed in 2008, was also renewed and its members were reappointed. Its members are: Stephen Rapundalo (city council); Julie Grand (park advisory commission); Bill Newcomb and Ed Walsh (citizens with demonstrated golf operations expertise); Thomas Allen (Ann Arbor citizen with group golf play experience); Barbara Jo Smith (Ann Arbor golf courses patron); John Stetz (citizen and member of a neighborhood association adjoining a golf course). The task force will be chaired by Rapundalo. Ann Arbor park advisory commission meeting (Jan. 18, 2011): Commissioners were set to vote on recommending approval of the updated five-year Parks and Recreation Open Space (PROS) plan, but decided to postpone their vote until the February meeting to allow for possible additional public input. A speaker during PAC’s public hearing on the plan had pointed out that the official public commentary period runs through Jan. 24. That prompted discussion among commissioners about whether to hold off until all possible commentary is heard – though some indicated there’d already been ample opportunity for feedback. Another public hearing on the PROS plan will be held at the planning commission’s Feb. 1 meeting, with a vote by that group set for Feb. 15. City council is expected to hold a public hearing and vote on the plan in early March. About 50 people showed up Friday morning in the city council chambers to hear a presentation by Miles of Golf partners about their proposal to assume operations of the city-owned Huron Hills golf course, and move their business there. 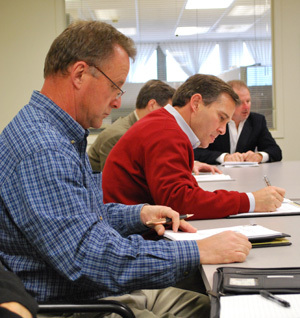 During the 90-minute meeting, president Chris Mile and other partners with the Pittsfield Township business gave a presentation and answered questions from a seven-member selection committee. Members of the public were allowed to submit questions, which city staff said will be answered and posted online within the next couple of weeks. Much of the presentation covered the same material found in the Miles of Golf initial response to the city’s request for proposals (RFP), as well a separate financial report. [.pdf file of Miles of Golf RFP response] [.pdf file of Miles of Golf financial proposal] The business has proposed operating the 18-hole, 116-acre course essentially unchanged for three to five years. Then, it plans to build a new facility on what is now the front seven holes – land east of Huron Parkway – with a driving range, teaching center and golf shop. It would relocate its current operations, which are located off of Carpenter Road, south of Packard, and convert the remainder of Huron Hills into a 9-hole course. They’re also hoping to partner with Project Grow or Food Gatherers, to put in a community garden on land they don’t plan to use for golf. To fund construction, the proposal calls for the city to issue a $3 million bond, which Miles of Golf would pay off over 20 years. The business proposes to pay additional funds to the city during that time, totaling about $1 million. Miles of Golf also estimates that the city would save about $5 million over the 20 years, since it would no longer be paying to operate the course – an estimated $250,000 per year. During their presentation, Miles of Golf partners addressed concerns that have been raised in the community. They stressed that the project would not put up perimeter fencing or pole lights, and that the land would remain accessible for winter activities, like sledding. Nor do they plan to build a banquet center – though they do hope to eventually sell food and beverages on the site, including alcohol. 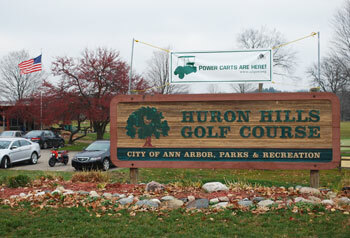 Currently, Huron Hills does not have a liquor license, though the other city course, Leslie Park, does. The selection committee that’s been evaluating two proposals for operating the Huron Hills golf course has selected only one – made by Miles of Golf – to advance to the interview stage. An interview with representatives from that business is set for Friday, Dec. 3 at 9:30 a.m. in city council chambers, on the second floor of city hall. 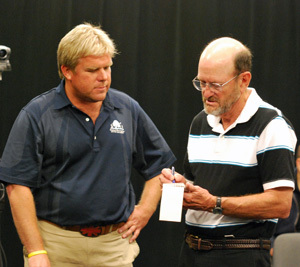 The meeting – which will be recorded by Community Television Network (CTN) – will begin with a presentation by Miles of Golf, followed by questioning from the selection committee. The committee includes Colin Smith, the city’s parks and recreation manager; Julie Grand, chair of the park advisory commission; Doug Kelly, the city’s director of golf; Ward 2 city councilmember Stephen Rapundalo; former city councilmember Mike Reid; Ed Walsh, a member of the city’s golf advisory task force; and Sumedh Bahl, the city’s community services area administrator. Ann Arbor park advisory commission meeting (Nov. 16, 2010): Budget issues were highlighted during Tuesday’s meeting, with a quarterly financial update from staff leading to a broader discussion about how much general fund money is used to subsidize parks operations. Parks manager Colin Smith reported that the first four months of this fiscal year – from July 1 through Oct. 31 – are off to a good start. Year-to-date revenues of $918,091 represent an increase over the same period last year, when revenues were $793,783. Expenses for that period are down from $1.23 million last year to $1.07 million this year. Commissioner Tim Berla asked for clarification about how much support parks is getting from the city’s general fund, and Smith said he’d prepare a report on that issue for PAC’s December meeting. General fund support for parks is important to track, Berla indicated, because it reflects a promise that city council made prior to passage of a parks millage in 2006: That the total general fund subsidy for parks wouldn’t be diminished as a percentage of the overall general fund. The issue also ties into which part of the city budget will be used to pay for dam maintenance. During an update on the $1.168 million Argo Dam bypass project – which PAC had recommended at its Oct. 19 meeting, and which the city council approved on Monday – Berla said he’d like to have a discussion about how to get city funding for a skatepark as well. As a result of that request, PAC will likely have a work session in December or January that focuses more broadly on prioritizing capital projects, including a skatepark. Other potential projects mentioned by commissioner Gwen Nystuen include the Allen Creek Greenway, another dog park, and increased connectivity for the park system’s trails and pathways. Commissioners also got an update about the two proposals submitted for Huron Hills Golf Course, and heard from parks planner Amy Kuras on the status of capital improvement projects for the parks. Kuras reported that West Park is now open to the public following an extensive renovation, and that a draft of the Parks & Recreation Open Space (PROS) plan will be distributed soon for public feedback, pending a city council vote authorizing that action. About a dozen people attended Monday afternoon’s pre-bid meeting for those interested in responding to the city of Ann Arbor’s request for proposals (RFP) seeking a public/private partnership for the Huron Hills Golf Course. Anyone who plans to submit a response to the RFP was required to attend the meeting, which lasted 30 minutes and was followed by a field trip to tour the course. Among those attending were Doug Davis and Chris Mile of Miles of Golf, Doug Hellman of KemperSports, Joe Spatafore of Royal Oak Golf Management, and William Arlinghaus of Greenscape. Also attending were several citizens who have publicly opposed the RFP process, including Ted Annis, Nancy Kaplan, Myra Larson and Paul Bancel. Some are involved in the citizens group Ann Arbor for Parkland Preservation (A2P2). Ann Arbor Park Advisory Commission meeting (Aug. 17, 2010): About 30 residents attended Tuesday’s PAC meeting, many of them speaking against the city’s plan to issue a request for proposals (RFP) for the Huron Hills Golf Course. Several expressed concerns about what they see as the city’s attempt to privatize the course, which they described as a beautiful, beloved parkland asset. Some said it made no sense that Ann Arbor supported a greenbelt millage to preserve open space outside the city, while selling development rights to parkland it already owns within the city. The issue drew two city councilmembers to the meeting – Sabra Briere (Ward 1) and Stephen Rapundalo (Ward 2) – as well as former and current council candidates Sumi Kailasapathy, Jack Eaton and John Floyd. Councilmember Mike Anglin, who serves as an ex-officio member of PAC, also attended. Former planning commissioner Sandra Arlinghaus and her son William Arlinghaus both spoke to PAC, urging them to widen the scope of the RFP so that it might include more creative possibilities, like a location for cremains. A couple of people also spoke in opposition of the Fuller Road Station project, citing similarities with the Huron Hills situation. In both cases, they said, the city is attempting to use parkland for other purposes. The Fuller Road Station is a proposed parking structure and bus depot, which might someday include a train station. During deliberations, most commissioners voiced support for the RFP, noting that the golf course – though doing better – is still losing money. [The accounting method used to determine how the golf course is performing financially was a point of contention by some speakers during public commentary.] Several commissioners pointed out that the city is under no obligation to accept any of the proposals that might be submitted. 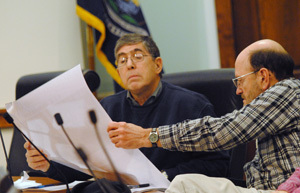 And Colin Smith, manager of parks and recreation, emphasized that the city would retain ownership of the land – there are no plans to sell Huron Hills, he said. He also noted that the RFP calls for proposals to be golf-related. Ann Arbor Park Advisory Commission meeting (June 15, 2010): A temporary venue change led more than two dozen people to the Community Television Network studios for this month’s PAC meeting. 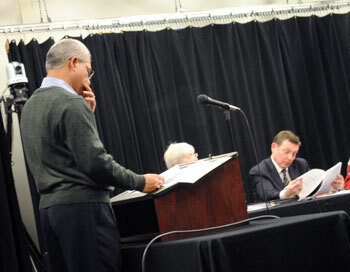 The main agenda item was consideration of two resolutions regarding Fuller Road Station, and many people who attended the meeting were there to address commissioners on that topic – most of them protesting the use of city parkland for what will, at least initially, be a large parking structure and bus depot, built in partnership with the University of Michigan. Park commissioners have expressed concerns about the project, and resolutions were crafted to address those issues, including a possible financial loss to the parks system and a lack of transparency in the process. 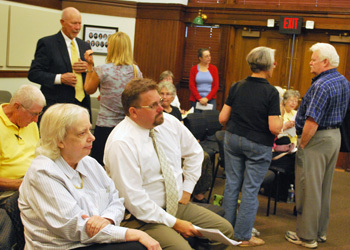 At several points during deliberations, Christopher Taylor – a city councilmember and ex-officio member of PAC – defended the process, indicating that while it was a misstep that PAC wasn’t formally asked for input, there had been many opportunities for public participation. PAC ultimately approved a resolution that asks city council to make available a complete plan of Fuller Road Station – including any significant proposed agreements, such as what the university will pay the city for use of the structure – allowing sufficient time for a presentation at a televised PAC meeting before council votes on the project. The resolution also asks that staff and council ensure the project results in a net revenue gain for the parks system. 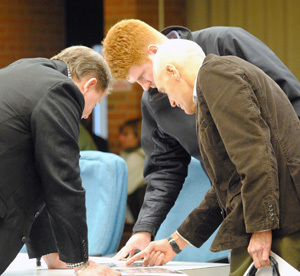 Several other speakers during public commentary addressed the issue of Huron Hills Golf Course, and expressed concerns that the city would seek to privatize it. During his manager’s report, Colin Smith told commissioners that a draft request for proposals (RFP) regarding Huron Hills won’t be finished until August at the earliest, and will be brought to PAC for review before being issued by the city. The meeting also included a presentation by Molly Notarianni, the city’s market manager, with an update on the farmers market and public market activities. Ann Arbor Park Advisory Commission meeting (April 20, 2010): At Tuesday’s meeting, park commissioners gave their blessing to proposed fee increases and the parks budget for FY 2011, recommending that city council approve both items. The proposed budget would keep all of the city’s 157 parks open, but would cut back maintenance – mowing and snow removal – on 17 parks. The budget also proposes keeping open Mack Pool and the Ann Arbor Senior Center, which had previously been slated to close. A handful of supporters for those two groups who attended Tuesday’s meeting applauded when commissioners approved the budget. Only one commissioner – Gwen Nystuen – voted against recommending the budget, citing objections to a proposed rollback of funds for the city’s Natural Area Preservation (NAP) program. Nystuen also floated a proposal to form a subcommittee that would review the impact of the Fuller Road Station. That project, which is jointly funded by the city and the University of Michigan, would initially include a large parking structure and bus station on city-owned land that’s designated as parkland. Nystuen has been vocal about her concerns over setting a precedent with this project, and frustrated that PAC hasn’t taken a more active role on the issue. Ann Arbor Park Advisory Commission (Nov. 17, 2009): With the golf season coming to an end, the city’s Park Advisory Commission got a status report from Ann Arbor’s director of golf, Doug Kelly. He did not, however, provide a recipe for his chicken salad, which he added to the menu this summer at the two city-owned courses. Then again, no one asked – but someone did ask when the golf courses were expected to break even. Also at the meeting, PAC honored Roger Wykes, the 2009 Natural Area Preservation volunteer of the year. Wykes helps out with the city’s breeding bird survey – commissioners heard details about that project from ornithologist Dee Dea Armstrong.